What would Sherlock Holmes say about Mormonism? Greetings avid readers. I have taken on a vain ambition in 2015 to apply the simple problem solving skills heard in the “Murder Mystery” genre and to think how the famous detectives and problem solvers would apply that thinking to great moments in Mormon history. You see I often find myself remembering Columbo asking “one more thing”, or having an Angela lansbury moment while sifting through history; and as such thought it might be fun to let my readers experience the kind of thoughts that come from it. That’s right, the very first Murder Mystery featured the villains to be none other than the Mormons. Specifically Danites the Mormon secret police (although in the book they are far more like ninjas, magically materializing through walls and such). 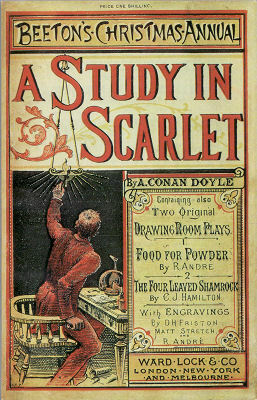 However, in a preface to Volume II of The Complete Novels and Stories of Sherlock Holmes, Loren D. Estleman noted the implied criticism of the Mormons. He states that the story was not controversial at the time of the story’s release, probably due to reports of the Mountain Meadows massacre and the small membership of the church. So I don’t even have to project what Sherlock would have done because the idea of murder mysteries and mormons launched the genre. I will attempt to update a new entry in this category each week.